Remember when kids played outside? They’d head to the backyard or to the park. They’d crawl around in tall grass. Maybe they’d even try to catch a frog or two. These days it’s all about screens. Computer screens. Phone screens. Television screens. Fewer and fewer kids want to head out to have a real adventure these days. Not your child, though! Your child is going to head out into the world to catch every last Pokemon out there. Of course, you might need to give your young one a little bit of inspiration. Before you run out and try to get them a starter Pokemon of their very own (we recommend Squirtle) you might want to start with the basics. Yes, the first order of business is getting your little adventurer the proper outfit, like this child Pokemon Ash costume! 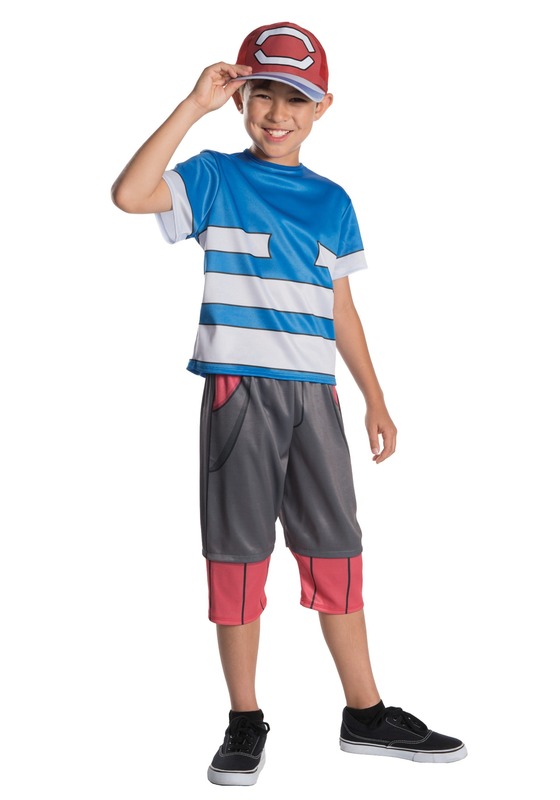 Based on Ash Ketchum, the most famous Pokemon trainer in the world, this child costume helps get your child ready for a journey to find some new critters to catch! The blue shirt has white stripes to match the one worn by Ash in the anime series. It also comes with a pair of gray shorts with red bottoms. It even includes the iconic hat worn by the young Pokemon trainer, which is perfect for turning backward during the serious battles! So, now you can send your child out into the tall grass to find a critter or two! There is still that business about a starter Pokemon though… Hey! Perhaps you could dress up in one of our Pikachu costumes to become your young one’s newest Pokemon! Just think about it—parent and child heading out into the world to become the best, like no one ever was. Just make sure you’re ready to do battle with other Pokemon!